We are constantly keeping an eye out for possible system changes that work towards a better balance throughout the game. While still keeping the game challenging and fun to our players, we hope that Maplers will be able to feel a stronger sense of achievement while progressing through the game. As such, it is with great pleasure to bring the following news to all our players. 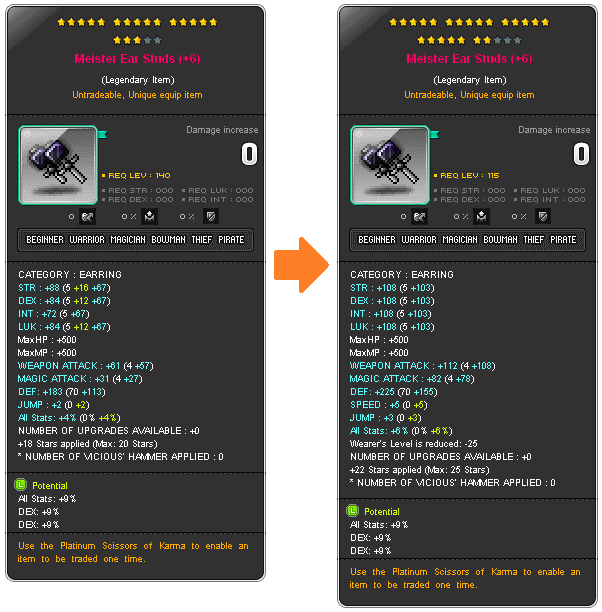 The current maximum achievable Star Force Enhancement is 20, unique among all variants of MapleStory services. In v178, the maximum Star Force Enhancement will be raised to 25, in accordance with Korea MapleStory Service's Star Force Enhancement System. As such, there will be several changes made to the Success/Fail/Destroy Rates for Star Force Enhancement, along with its Meso cost. However, Star Force Anti-Destruction remains as it currently is; It will be able to protect up till 17 Star Force Enhancement from destruction, at double Meso cost per enhancement. If you would like to find out more about the Star Force Enhancement System, please click here to read its related patch notes to learn more about it. Currently, MapleStorySEA has Additional Options that can be obtained in addition to stats obtainable via regular enhancement and Star Force Enhancement. However, the Additional Options obtained were not consistent across different content throughout the game (e.g; Loots from Elite Boss Bonus Stage have a different Additional Options pool compared to Additional Options obtained via other means). As such, the obtainable Additional Options will now be standardized across all equipment and content. As of the v178 Content Update, higher Additional Options can be obtained compared to v177 and before. Note: Existing Star Force and Additional Options will remain as it currently is even after the v178 Content Update. We hope that all Maplers look forward to the above-mentioned changes and are as excited as we are, and we look forward to our MapleStorySEA players becoming more powerful and accomplishing greater achievements. We would also like to take this opportunity to thank all our loyal Maplers who have been supporting us throughout the years. This change is just the beginning of a new era. There are many more fun and exciting content which brings new challenges, and we can't wait to bring them to our service! Thank you, and we wish you the best of luck!